I had a lunch date with BFF LB today, and when I asked her what she was in the mood for she said “a big fat veggie burger”. Now she assumed I knew the best place to go for a veggie burger — and I do know of some great places –but none of them are near my work. 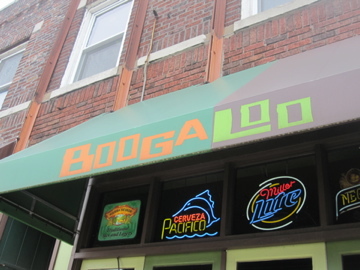 So I did some online research and learned that a funky little place called Boogaloo had a house made veggie burger. Decision made. I strangely was craving salmon today. I’ve recently been thinking about adding more fish into my diet but still don’t ever make it for myself. 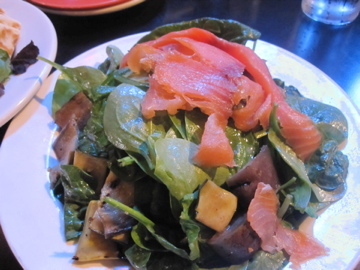 I decided to go with their spinach salad which came with grilled veggies and smoked salmon. I asked for their sherry vinaigrette instead of the ranch it came with. SO MUCH SPINACH. Just how I like it:) The salad was absolutely delicious and the salmon was fresh and buttery. My only issue was that a few of the grilled eggplant pieces had a weird taste. Other than that this salad was pretty fantastic and I’d definitely get it again. 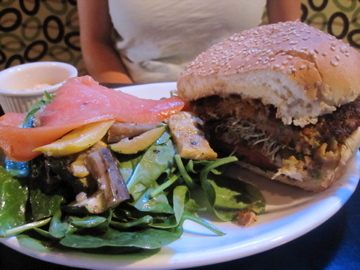 LB satisfied her craving for a veggie burger with a half-and-half: half spinach salad and half veggie burger. Yes that is half of a burger. Huge! The burger came with avocado, tomato, sprouts, and a side of “volcano sauce”. According to LB the burger was a mixture of rice and veggies and didn’t have a ton of flavor. She also wished the volcano sauce was spicier. 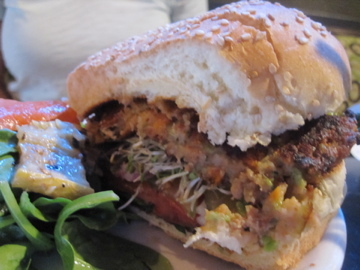 But it looks great to me — any restaurant that makes their own veggie burger is A-Okay in my book. Now I have to go back and try it myself! 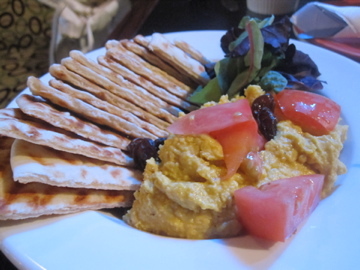 And at the last minute I threw in an order of their “curried chickpea hummus with Jamaican flatbread”. I think because I was worried the salad would be small and not very filling without some carbs. I only had a few pieces of this at lunch but ended up finishing it later in the afternoon. I knew it was a huge snack, but I couldn’t stop dipping the doughy pita into the lightly spiced dip…sooo good! It left me very full and I didn’t get hungry for dinner until 7:30pm which rarely happens. Another smoothie craving hit (a daily occurance lately) so I whipped up one of my “Very Berry Green Monsters” and topped it with a handful of Kashi Go Lean. Two whole wheat wraps rounded out the meal…because I have some weird addiction to eating wraps plain. I’m gonna head home in a bit and hang out with my parents (they are having game night with friends) and probably rent a movie! I need a low key weekend because next weekend is gonna be a big one. Goodnight! WOW. That burger is gigantic! I can’t even imagine doubling that and being able to eat it! I am not usually a fork and knife kinda girl for a burger.. but I think if I had one that big, I just might have to use them! do you parents have u-verse? I’ve totally been craving salmon lately, too. That SIAB looks incredible. My mom and her sisters have game/movie nights every Saturday, haha. Usually I never go because I’m either doing homework or at my apartment. I’ll probably have to crash one this summer. Weee :), what’s going on nxt wknd? Mmmm I’m always craving veggie burgers! Haha and that hummus + pita sounds amazing… so addictive! HOLY CRAP I WNT THATBURGER!! 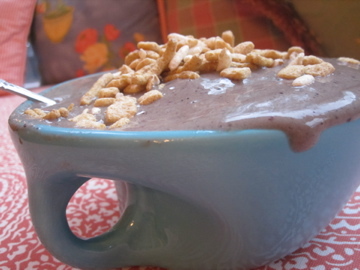 ur smoothie is overflowing too! love! your bff went to the right person for veg burger guidance 🙂 enjoy your weekend girly! smoothies seem to be my life base lately. my body is having lots of foods and smoothies are the only thing not hurting my belly. hahha Mmmmmm Salmon is the best!